Heavy rainfall, strong winds or lightening strikes can cause damage to your home’s roof and cause roof leaks. If such damage occurs, swift action can help prevent a small problem from becoming a major catastrophe. Do not attempt to fix the problem yourself, especially not while the storm is still raging. Make a call to a qualified roofing contractor who has the equipment, skills and experience to deal with the problem quickly and efficiently. Be prepared to describe the damage over the phone so the roofer can make a determination on whether emergency repairs are necessary or if they can wait until the storm abates. Emergency actions may include securing tarps over the damaged section of roof to prevent further inflow of water, shoring up damaged chimneys to prevent loose bricks from falling to the ground, and securing any damaged utility lines with the help of utility repair crews. In the light of day and/or drier conditions the roofing contractor can make a more complete assessment of the damage. It may be that a damaged section of roof can be isolated and repaired, without having to replace the entire roof. The roofer will do his best to match materials in order to make the repaired section look like the rest of the roof. In the event that damage is more extensive, temporary repairs may be put in place while the roofing contractor prepares a plan for roof replacement. 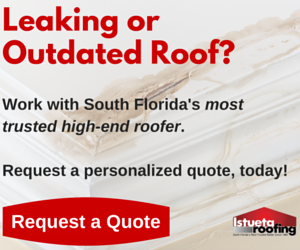 Look for a Miami or south Florida roofing contractor who has experience working with insurance companies to help speed the process.